A String Of Dangerous Accidents In Alaska Sends BP Reeling, Emails Show: The GOP wants OSHA to “advise” companies, not enforce regulations. 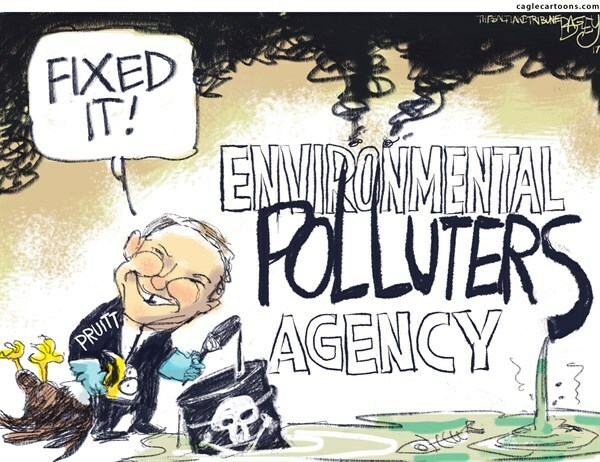 The EPA will kill us all. EPA issues proposed rule rolling back the Clean Power Plan. Federal ethics chief tells agencies he is “deeply concerned” about the actions of top officials. VP Pence visits emergency headquarters in California, says DT has approved disaster relief for areas hit by massive wildfires. Former Secretary of State Henry Kissinger meets with DT, offers advice on foreign policy. Canadian Prime Minister Justin Trudeau arrives in DC, where DT makes another threat to withdraw from NAFTA.